1) How can I ID the pistons? I was told they were Yoshimura, but this could be wrong. 2) Where would I be able to find piston rings for them? 3) What thoughts are there on using the aluminum rods on a street engine? The head looks to be ported, and its definently been "hemi'd". 4) The rods are solid. There are 2 bolts that go through them, but they are not 2 pieces. It looks like Falicon rods are made the same way. I know stock rods are 2 pieces. Now, is this normal? Don't they need to be 2 pieces? If not, what's the point of the bolts?. If they do need to be 2 pieces, do I take them to a machine shop and get cut? 5) Any opinions on what direction to go with this? I want something reliable but something that can be some fun on the street. Should i upgrade valves? If so, what would be recommended? I appreciate the help, as I'm new to engine performance and could use all I can get. welcome to the forum! Seems you got some nice parts there to build your engine. 1. Yoshimura pistons usually are markes "POPS" or "YOSH" somewhere. Maybe you can post pictures of your pistons (to post pics here, you need to put them on a server and post the link here - if you don't have a suitable server, mail them to me at sohc4de@gmail.com and I will post them for you). 2. Piston rings. That depends on which make they are, there are some piston ring manufacturers around which may be able to help. 3. I personally would not use aluminum rods in a street engine. They may stretch after time, and if they do, it's major havoc time. OTOH, with 812cc and a suitable cam, you won't really need special rods. 4. Seriously, they must be two pieces - the crank is forged in one piece, and if the rods were one piece as well, there would be no way to get them on the crank. Maybe someone polished the rods so that the parting line became hard to detect? 5. 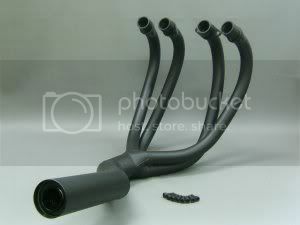 What I would do is like this: Use your 812cc pistons, stock rods, a cam like Web Cam's 41b or Megacycle's 125-65. With a ported head and some tuning this should get you around 75 HP. If you aim for some more ponies, try Web Cams 63b or Megacycle's 125-25, and 31mm Keihins. Especially with the ported and hemi'ed head, check the compression ratio, it should not be lower than 10:1. With a 'hot' cam with big overlap you will loose compression anyway so it's important to maintain a good c/r. I would stay with the stock valves (BTW, what model/year is your motor). Rather, take your head to an experienced engine builder and let him have a look at it - the stock valves also have some potential with correctly ground seats. MRiek who is also on on the sohc4.net forum is offering porting and head work and has a good reputation. Hope that helps for first directions, if you have more questions, just fire them off! Thanks for the info Axl. Yes, the pistons do say Pops 812 on them, so it does seem to be a Yosh kit. And yes, the rods are two pieces, they were just so nicely polished that I did not want to hit them with a rubber mallet, but curiosity got the best of me and they came apart as they should. The rods are are made by MTC. They are just so much lighter then stock that I thought it would help the bike spin faster. But based on what you said, I'll pass on the aluminum rods... Ebay it is for them, unless someone here wants them. I think I need new valves for this head. That was really why I asked about new valves. There is some surface rust on the faces of the valves that I could clean off and reuse, but then I'm concerned about how smooth the surface will be. I would replace them with the stock size replacements. Any recommended manufacturers? As for model/year, I know its an early K head. I also received the price list for port and polishing from mreick over at sohc.us over the weekend.. Would you recommend using the heavy duty valve springs and retainers? Or are the stock spring ok? Thanks again. Great! If it is a Yosh kit, they should have a compression ratio of around 10:1, which is good - provided your combustion chamber isn't larger than stock, which I doubt it is. Anybody who is savy enough to 'hemi' the head would be wise enough to mill the head afterwards to restore the original volume of the combustion chambers. I would not care tooo much about surface rust on the valves - what I would recommend anyway when you have the head apart is polish the valves in a electric drill or a lathe, if you have one. Start with sanding paper (the old valves were pretty rough, 280 would be fine to start) and work your way up to 400 or 600, then polishing paste. If you plan to stay with the stock cam or with a really mild cam, then the stock springs will be ok. Otherwise, I would go for the HD springs. The Ti retainers are a good idea anyway - they will reduce the masses without putting more load (and stress) on the valve train. I'm running the 812 Yosh kit with their Daytona Full Race cam, S & W HD valve springs that came with the kit I believe (almost 30 years ago), stock retainers, and stainless Manley stock size intake valves along with my STOCK rods. Head is stock otherwise (until it comes apart for the 900 kit and fresh head gasket and cam tower pucks then it goes to Mike Rieck) . It is a 75 750F0 that was the first to use a factory hemi design. The head has 392 cast onto the top rear fin between #2 & #3 (not to be confused with my K8 head that has 392 cast & K8 hand stamped). 10K often and it still has power at that rpm. No problems with this set up in 25,000 miles. I'd definitely recommend the HD springs to prevent valve float at high rpms when you miss that occasional 2nd gear shift like I did. The broken intake valve ruined my almost new engine. As far as rings go, approx 10 years ago I sent 1 piston to Hastings Rings for ID. I was told that it uses early CB350 2 cylinder rings (68 to 72 or whatever year they stopped making the 350 & went to 360). I bought Honda rings and got the 3 piece oil ring sets. They worked much better than the previous 1 piece oil rings I had used. Thanks for the help guys. I will probably run either the 41a or 63a cam by webcam. Stock valves, stock rods, HD spings and Ti retainers. I'm leery about this head I have now. Who knows if the guy that did the work to it did it right. Maybe I will just get another 750 head and send it to MReick to be worked over. Thanks again for the help, I appreciate it. I'm going to go with a Wiseco 836 kit, 63a Webcam, Mikuni VM29 smoothbores, Kibblewhite HD Springs and new (from dynoman, maybe APE?) Titanium retainers. I had Terry from Team Hansen Honda do my cylinder boring, and they came back looking great. I do still have some questions. Just options really. 1) With this setup, would you go with oversize intake valves or stay at the stock size? 2) Rods....I've got two options as for what to use. Terry from Australia sent me some heavy duty steel rods from a former drag racer in exchange for a crank of mine being sent to APE for his use (they look like breathed on stock rods, light gray in color compared to the brownish color of the stock ones). I could use those OR have a set of F2/F3 rods magnafluxed and shot peened. i could then buy new F2/F3 rod bolts and nuts and use those. What would you recommend? 1. With the setup you have in mind, I would stay with stock valves. The 63a has enough lift so that you will be fine with the stock valves up to +10k revs. Gas velocity should be no more than 100meters/second at the intake valve. I did the math once for 900cc and a Megacycle 125-25 which has less lift and it reached 100m/s at 9500. Now you have more lift and less displacement which means you are well on the safe side. 2. It's hard to say what has been done with Terry's rods. When you get another set done, you will have a better idea of what has been done to them and what to expect from them. But in either case, I would recommend new bolts! Ah, Axl, you're the best. Thanks for the info again. I picked up a late K0 head from ebay for a song ($9 plus shipping, no broken fins). I am going to replace the valves and guides anyway, so that didn't concern me. My question is, can I use this with K4 cylinders without a problem? As previously mentioned, the matching head to my cylinders has already been modified, and I don't know if I would trust the work. Also, I would like to send a fresh head to MReick instead of one that has already been worked on. Hence the $9 K0 head. The head came off a bike that was post engine #1026144.